Eurotech Assessment and Certification Services Pvt. Ltd. (EACS), is providing its business of service for variety of services in India and Abroad. The organization brief service entity includes Risk Management, Welder Training Service, CE Marking Certification Service, Electrical Testing Service, Social Audit Service and many more services. Risk Management - A Basic Understanding. Literally speaking, risk management is the process of minimizing or mitigating the risk. It starts with the identification and evaluation of risk followed by optimal use of resources to monitor and minimize the same. Risk generally results from uncertainty. What is Risk : Risk is an affect of uncertainty on objectives. Risk management plan is scheme within the risk management framework specifying the approach, the management components and resources to be applied to the management of risk. Management components typically include procedures, practices, assignment of responsibilities, sequence and timing of activities. The scope of ISO 31000: 2009 Standard provides principles and generic guidelines on risk management. Risk Evaluation: The risks can be evaluated from a stakeholder or customer point of view and the organization point of view and the approaches and the tools to minimize and mitigate it. Large numbers of tools are available to identifying, analyzing, evaluate, treat, monitor and review it. The organizations have laid down principles for risk management. There are risk management principles by International standardization Organization and by Project Management Body of Knowledge. The Project management body of knowledge (PMBOK) has laid down 12 principles which are displayed in the diagram below. A good risk management plan carries number of tools and strategies to mitigate risk. The strategy may be to avoid risk or transfer a component of it to another project so that the impact is reduced. Risk matrix is a matrix that is used during risk assessment to define the level of risk by considering the category of probability or likelihood against the category of consequence severity. A Risk Register is a document which outlines the potential threats to the ongoing operation of an organization and what mitigation measures are in place to minimize the likely occurrence of these threats. A risk management plan can never be perfect. However, the degree of its success depends upon risk analysis, management policies, planning and activities. A well-defined management plan can be successful only if risks are properly accessed. A risk treatment is mandatory a part of an effective risk management plan. The plan here means how you respond to the reported potential risks. It details on strategies on how to deal with the various risks - low or high, acceptable or unacceptable. The strategies are Avoiding Risk, Transferring Risk, Mitigating Risk and Accepting Risk. 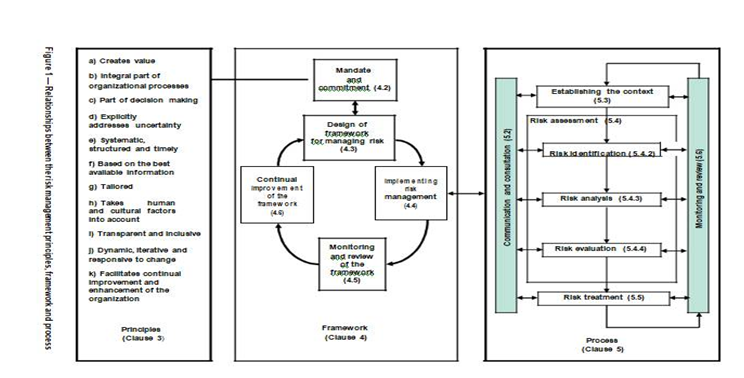 The relationships between the principles for managing risk, the framework in which it occurs and the risk management process described in this International Standard are shown in Figure 1 above. The generic approach described in this International Standard provides the principles and guidelines for managing any form of risk in a systematic, transparent and credible manner and within any scope and context. Eurotech Assessment and Certification Services Pvt. Ltd. (EACS), J 146, JLPL Industrial Area, Sector 82, Mohali, Punjab (India) is counted as the leading organization in the ISO Quality Management Training Services, Risk Management with practically oriented activities to our valued customers. Our services are widely appreciated for its professional leanings.